Our newest pants are rolling in and make the perfect addition to any wardrobe! Perfect for the woman on the go, or the stay at home Momma Bears… They travel well and clean up easily. Wear them around the house with slippers or out to dinner dressed up with heels. A truly versatile pant. With a wider yet still loose elastic “adjustable” waistband, these have total comfort hidden in a stylish package. 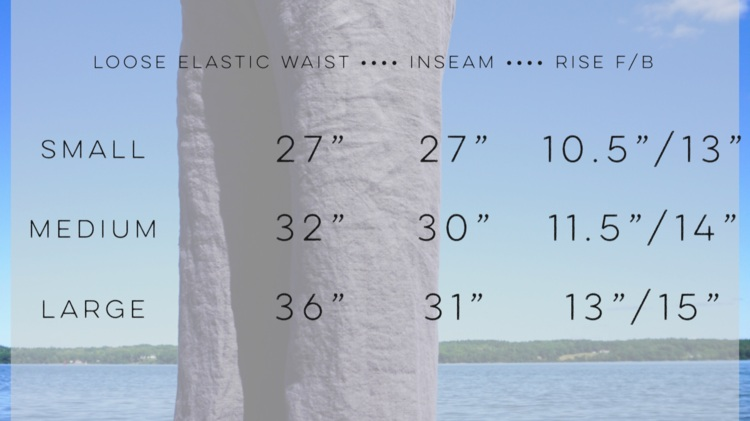 We call the waist adjustable because you can slide the fabric loosely along the elastic, so you can move the “bunching” around to where it’s most comfortable for you! The waistband is made to sit at a mid-waist area, not too high, not too low. The legs are wide and straight with the logo on the lower right leg. Charcoal Gray, Indigo & Black; 100% linen and pre-softened, this is a medium weight line… draping and soft, making it perfect for year round use. Not stiff or itchy, but it does have a bit more texture to it and is pre-processed in a hot water wash to be softer and to allow the wrinkles to blend a bit more. Great for all season wear! Small Batch Nutmeg & Peacock; 55% linen & 45% cotton blend. A great all season weight linen, Perfect for layering or on their own. These colors are small batch and quantities are limited. Many of our pieces are great for year round wear, it’s all in how you style it… ‘Made for life' means quality and longevity and ease of style. When the pieces in your wardrobe are investments, it’s a great added bonus to have them work for more than just a few months out of the year and with more than one outfit. Available in Small, Medium, Large & Custom Request. Our model is 5’ 5” , 150 lbs, and wearing a Medium. Please see the size chart below to assess whether you need custom sizing. Right now we are building the inventory up in small batches, please allow us 1-2 weeks to measure, cut, pin, sew, wash, iron, pack and ship your item. When items ship, they will be USPS Priority mail and you will receive an email with tracking. Care; Preshrunk, but for best fabric longevity wash in gentle cold water and tumble dry on low heat or hang dry. These have a wonderful soft wrinkle to them, making it unnecessary to iron them all the time. However, if you desire a crisp clean look use a hot steam iron. Sign up for our Mailing list & receive all the latest news and updates. Plus you’ll get a a 10% off coupon code for your next order! Sign up & receive your code! Use it on your next order and get 10% off! Thank you for wanting to be included! Make sure to write that down. Retailer & Stockist requests welcome, Please contact the Owner here for a password to our Retailers page. All content & photography is property of Amphitrite Studio. Copyright 2019.